Miss South Africa Demi-Leigh Nel-Peters is the announced winner of Miss Universe 2017, Miss Colombia finished runner-up. 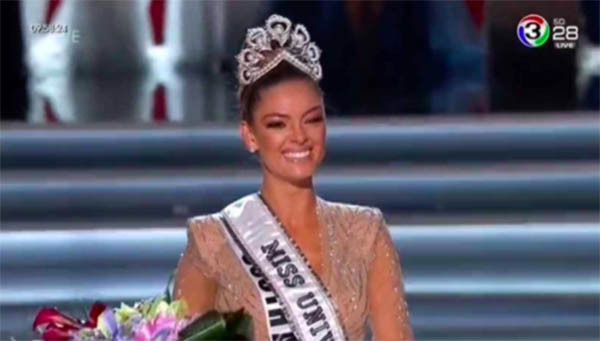 Demi-Leigh Nel-Peters from South Africa is the crowned winner of the recently concluded Miss Universe 2017 beauty pageant. South Africa bested 91 other contestants during the Miss Universe 2017 grand finals held at The AXIS in Planet Hollywood, Las Vegas, Nevada on Sunday, November 26, 2017. Other winners of the Miss Universe 2017 beauty pageant are Miss Colombia 1st runner-up and Jamaica finished 2nd runner-up. Miss South Africa Demi-Leigh Nel-Peters will fulfill her duty traveling around the world to represent the Miss Universe Organization and its various causes.